An estimated 490 Tamil migrants seeking refugee shelter in Canada will be investigated to determine whether there are "human smugglers or terrorists" among them, Public Safety Minister Vic Toews says. An estimated 490 Tamil migrants who arrived on a ship seeking refugee shelter in Canada will be investigated to determine whether there are "human smugglers or terrorists" among them, Public Safety Minister Vic Toews said Friday. Speaking to reporters in Esquimalt, B.C., Toews said Canada has been "very welcoming" of refugees, but the government "must ensure that our refugee system is not hijacked by criminals or terrorists." The minister said the government will consider whether "further improvements" are needed to disrupt and deter criminal organizations and enterprises such as human smuggling, but gave no further details. 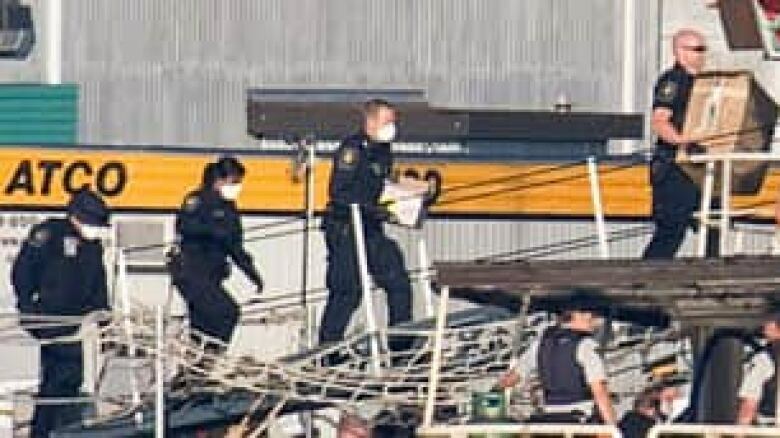 The Canada Border Services Agency will take the time necessary to identify and process all individuals who were on the ship in accordance with Canadian law, Toews said. He pledged that any individuals who endanger national security or who have engaged in human smuggling "will be prosecuted to the full extent of the law." The migrants are believed to be Tamils from Sri Lanka who left their homeland in May aboard the MV Sun Sea. They arrived earlier Friday at CFB Esquimalt after spending almost 90 days at sea. Tamil migrants look over the side of the MV Sun Sea. (Jonathan Hayward/Canadian Press)The government has said it believes some of the migrants are members of the Liberation Tigers of Tamil Eelam, also known as the Tamil Tigers, which has been outlawed in Canada as a terrorist group since 2006. A CBSA official told reporters those who were on board will be fingerprinted, photographed and screened for criminality. The examination is expected to take up to 72 hours because there are usually difficulties in confirming identities, the official said. Toews said the best way to deal with migrant ships is to wait until they enter Canadian waters. "Intervening on the high seas brings certain legal obligations and a number of legal problems, and so it's better to intercept them, I'm advised, inside of Canadian territorial waters." 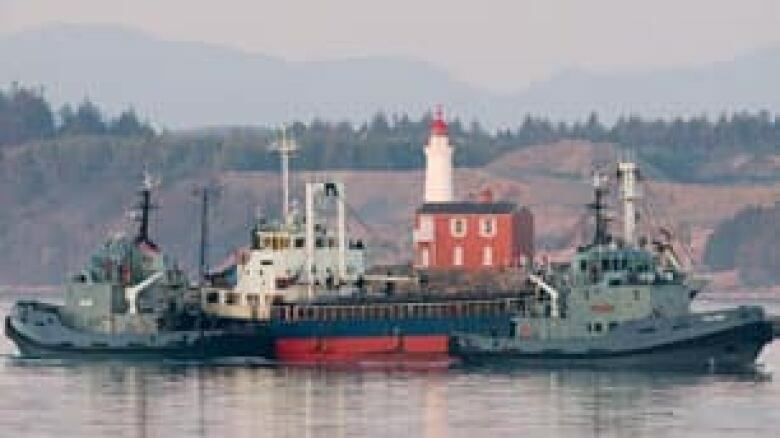 The 59-metre, Thai-owned cargo ship arrived at the base on Vancouver Island shortly before 6:30 a.m., escorted by two naval tugboats. It was docked about two hours later. Border officers and other officials donned surgical masks and gloves before boarding the ship, in light of reports there may be passengers with infectious diseases on board. Some reports indicate several passengers may be infected with tuberculosis. During his news conference, Toews did not discuss the migrants' conditions, saying only that the high number of passengers faced "certain difficulties in terms of living conditions" from such a long journey on a vessel that size. Officials briefing reporters after the minister's appearance also would not give specifics of the conditions on the vessel, but said there was "not a large medical need" for those on board. The migrants are expected to be transported from CFB Esquimalt to various destinations, including Victoria General Hospital and the Wilkinson Road Jail in Victoria. The CBC's Chris Brown reported that a family with several young children on the ship appeared to have their belongings in plastic bags. Some people were later seen at hospitals, he said. "We counted a dozen or so people from the ship arriving at a Victoria hospital but their condition was unknown," said Brown. Naval and RCMP officers had boarded the ship at about 9:30 p.m. ET Thursday, according to the Prime Minister's Office, to take control and steer it to Esquimalt. The MV Sun Sea is escorted past Fisgard Lighthouse toward CFB Esquimalt on Friday morning. (Jonathan Hayward/Canadian Press)Capt. Dermot Mulholland, spokesman for the Department of National Defence, described the boarding incident as "very calm," saying the vessel was "compliant" when Canadian officials took control. Many on board are believed to have paid as much as $50,000 each for the trip. 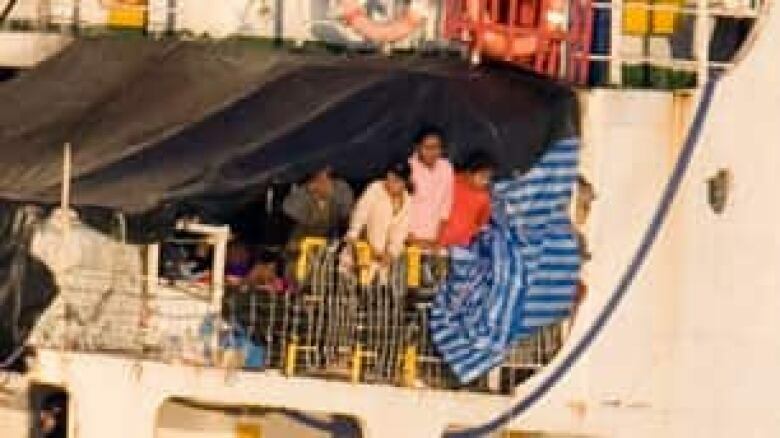 Sri Lanka's high commissioner to Canada, Chitranganee Wagiswara, said that money would go toward to the Tamil Tigers and chided the federal government for not turning the ship away. "Human smuggling is a criminal activity," he said. Calling human smuggling "despicable," "dangerous" and "irresponsible," Gary Anandasangaree, general counsel for the Canadian Tamil Congress, said the government should assess those aboard the ship "on their own merits and in accordance with Canada's laws and our international obligations." Anandasangaree said the congress is "ready, willing and able" to assist the migrants, including by providing translators, access to legal representation and initial financial assistance to ensure their rights are respected. "The legal system is apt in addressing these issues and will do so in due course," he told reporters in Esquimalt on Friday. He added his organization has not had any direct contact with those who were on board, but said it was "heart-wrenching" to think of so many people being on board a 53-metre vessel for so long. "It really shows the desperation people have in fleeing Sri Lanka and fleeing for their safety," he said. Liberal foreign affairs critic Bob Rae said the need for investigating and prosecuting human smugglers should not affect the rights of those seeking asylum in Canada. "I think it is important for everybody to take a deep breath, let the process of law proceed, understand that we do have a process that can work if we have the people to do the job, and we do, and making sure we are making the determination fairly," Rae told CBC News in an interview from Kingston, Ont. NDP immigration critic Olivia Chow said the government should punish those involved in human smuggling but show mercy to their victims. "If they are genuine refugees, they should be allowed to stay. and if not, let's deport them," Chow said. "We have a law that allows us to do that." As a signatory to the UN Convention on Refugees, Canada must process all refugee claimants who reach Canadian soil. Previous Tamil migrants said they were fleeing persecution after the country's bloody 26-year civil war between the Sri Lankan government and the Tamil Tigers. However, the Tamil Tigers were defeated in May 2009 and a recent UN report states that, after the war, Tamils would no longer be presumed to be fleeing imminent harm. The report says, in part: "Given the cessation of hostilities, Sri Lankans originating from the north of the country are no longer in need of international protection under broader refugee criteria or complementary forms of protection solely on the basis of risk of indiscriminate harm."